In 1866, just one year after the end of the Civil War, the first documented female baseball players took to the field at Vassar College. Those early pioneers paved the way for women who would play baseball as both amateurs and professionals up to the present day. Some were headlining stars on barnstorming teams, while others organized and operated their own teams, and from the 1890s through the 1930s they were known as Bloomer Girls, due to the baggy pants created by Amelia Bloomer. In 1988, the American Women's Baseball Association began play in the Chicago area. With play starting in 1990, the Washington (DC) Metropolitan Women's Baseball League is now the oldest operating women's amateur baseball league in the country. In 2001, a true baseball World Series was held in Toronto, Canada, with women's baseball teams from the United States, Canada, Japan, and Australia. That event will celebrate its fifth season in 2005. John M. Kovach is the Archivist at Saint Mary's College, Notre Dame, Indiana. He was the first male to be honored by the National Women's Baseball Hall of Fame, as Manager of the Year in 2002. 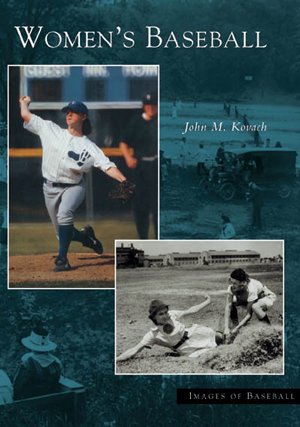 He is also the author of Baseball in South Bend in Arcadia's Images of Baseball series.